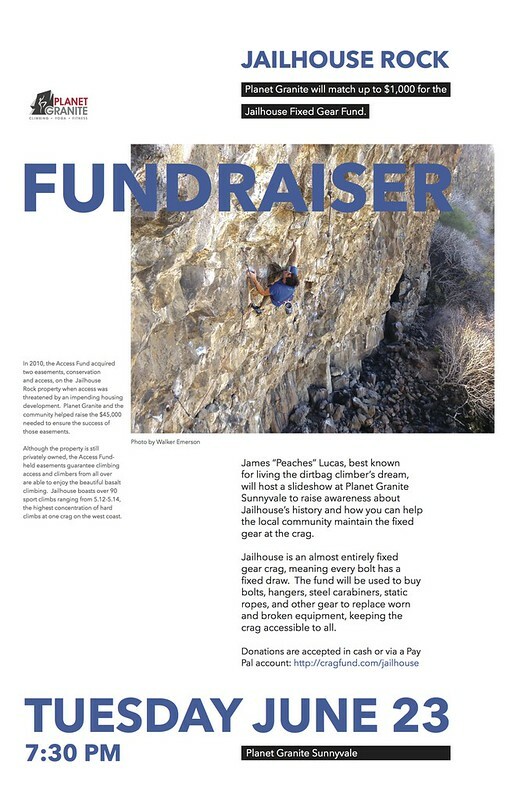 4 years ago, Planet Granite helped raise over $23,000 for the Access Fund to keep Jailhouse Rock open to climbing forever. As a result of this huge achievement, climbers from all over have been able to experience Jailhouse, which was a previously unpublished crag on private land. A steep columnar basalt crag with over 90 routes ranging from 5.12-5.14, Jailhouse offers the largest concentration of hard sport climbing on the west coast, just 2 hours from the Bay Area. Many steep sport crags have fixed draws, as it can be incredibly difficult to remove draws on that terrain. As result, gear that’s left for months or years can get worn down: draws fray or carabiners develop sharp edges. Usually, the understood responsibility is that the climber projecting or climbing who finds poor gear should replace it. However, as climbing at Jailhouse has gained in popularity, the amount of gear needing replacement has increased drastically. Knowing that a lot of our members climb there, and having been involved in making Jailhouse permanently accessible, we are excited to help! Planet Granite will match up to $1000 of all donations received for the Jailhouse Gear Fund. All proceeds will go directly to purchasing new draws, carabiners, bolts and hangers. To donate visit www.cragfund.com/jailhouse. Join special guest speaker, James Lucas for a fun night and help us raise money!